If you have been in social media for any length of time, you know about the Streisand Effect, named after an infamous situation involving singer Barbara Streisand. She attempted to suppress online photos of her Malibu home, creating an internet backlash that assured the photos received substantially greater attention. People evoke the term "Streisand Effect" whenever an attempt to remove information from the internet backfires, resulting in that information being publicized much more widely. Today, NBC and Gary Zenkel are learning firsthand about the Streisand Effect. Allow me to demonstrate for you how the Streisand Effect works: Gary.zenkel@nbcuni.com. That email address is for the President of NBC's Olympics, Gary Zenkel. We know this thanks to Guy Adams, The Independent's Los Angeles bureau chief, who had used Twitter to express great frustration over NBC's time delays and editing choices. NBC felt Adams crossed the line when he tweeted Zenkel's address, so NBC requested that Twitter suspend the journalist's account for revealing the "personal information of one of our executives." Many are appalled that Twitter acquiesced, considering the format of the email address followed that of every other NBC Universal employee, plus that email address could already be found on the internet. Matthew Inman, the creator of The Oatmeal comics, was upset about his content being repurposed without credit by the website FunnyJunk, so he fought back with acerbic comics featuring criticisms of FunnyJunk. The targeted site responded with a legal demand Inman not only cease and desist but also pay FunnyJunk $20,000 of compensatory damages. Inman's subsequent promotion of this letter brought even more criticism of FunnyJunk's use of others' IP. More importantly, when The Oatmeal decided to raise $20,000 not to pay the damages but to donate to two charities, the site ended up collecting $220,000 instead. FunnyJunk not only failed to suppress the criticism, its actions helped the criticism go viral, instead. Labatt threatened to sue the Montreal Gazette unless the paper remove a photo of an infamous murderer drinking a Labatt beer from its web site. When word got out of Labatt's clumsy legal attempt, Twitterers launched an embarrassing new hashtag, #NewLabattCampaign, to shame the brand. Under intense scrutiny, the brand backed down. “Our goal was simply to protect our brand," said Labatt's VP of Corporate Affairs, but instead of protecting the brand, the heavy-handed response brought more unwanted attention to the very photograph the company had hoped to censure. In 1990, McDonald's brought libel proceedings against a small London environmental group that was distributing pamphlets claiming the restaurant chain, among other accusations, destroyed the rainforest and exploited children in its advertising. The McLibel Case, as it is now known, received international attention, resulting in vastly more people being exposed to the disparaging charges made by the environmentalists. McDonald's spent several million pounds on this case, and while they won a small settlement, the primary outcome of the company's efforts was to ensure that accusations so easy to overlook in London were instead disseminated globally. Is the offending information factually incorrect, or is it a statement of opinion? Do you truly have the legal standing to have the information removed, or are you grasping at straws and risking the appearance of censoring critics or customers? How visible is this information? How many people have seen it? Is it spreading, or is the information already being ignored and forgotten? Are brand advocates already stepping in to protect the brand and contradict the information? Does the information create actual reputation damage, or is it merely something that company executives find distasteful? Will the damage affect the financial performance of the organization? Are there safe ways of dealing with the problem, such as creating positive content to take focus away from the offending information? Can you engage the source of the information or others in a public dialog rather than resorting to threats or takedown requests? Is the source of the information one that is likely to respond quietly, or are they the type to turn to social media to continue embarrassing the brand? Is there a single source, or is the offending material being published by many? Finally--and most importantly--is it really worth the risk that your efforts will do more harm than good? It is hard to imagine why NBC thought the risks were worthwhile to bring action in this case. The Olympics will be over in two weeks. The information did not seem that damaging, nor does an executive's corporate email address seem highly personal and private. Criticism of NBC's coverage choices are quite widespread, so this action was not going to make a dent in that negative sentiment, even if the lid had not blown off the story. In addition, the person NBC targeted is a vocal media professional and highly engaged critic of NBC who has substantial access to both print and online media; in other words, he was not going to go down quietly. Social media professionals and their bosses take some things for granted. For example, having more Facebook fans is always better than having fewer. Hard to argue with that; the more Facebook fans you have, the stronger business results will be, because fans are happy customers. Plus, every fan acquired is another person who can be targeted for marketing with low-cost Facebook posts and apps. It makes perfect sense. It also happens to be wrong, at least as evidenced by an analysis of 40 top brands with some of the largest Facebook fan counts. For these brands, there is a negative correlation between fan count and customer satisfaction and no relationship whatsoever between fan count and stock performance. Do I think these results truly mean that Facebook fans have no (or even negative) value? Of course not, but there are vital lessons to be learned from this analysis: We put too much stock in the importance of our brands' Facebook fan counts; how you get fans is more important than merely having fans; and most companies are still doing social wrong. I examined a set of 40 companies, chosen because they are the top 200 corporate brands on Facebook (based on fan count) that are both tracked by the American Customer Satisfaction Index (ACSI) and publicly traded on the NYSE, NASDAQ, Frankfurt, Tokyo or Taiwan Stock Exchanges. By focusing on three attributes--Facebook fan counts, customer satisfaction ratings and 12-month stock performance--it is easy to calculate the statistical correlations between these variables. The ACSI does not track the brand's customer satisfaction rating. This precluded major brands with large Facebook fan pages, such as Disney, Red Bull and Converse. The brand is part of a privately held company and thus lacks market performance data. Brands such as Subway and Levis were omitted for this reason. The brand is only one of many owned by the parent company, and as a result, individual stock performance data is not available. For example, Taco Bell, Pizza Hut and KFC all have large fan pages but are collectively owned by YUM! Brands, so no stock market data is available for each of the individual brands. Also, despite having large fan counts, Bing and Xbox were not included since they are relatively small portions of Microsoft's business operations, but Microsoft itself is included in the list since it has a large fan count and is publicly traded. No correlation (-0.1) between Facebook fans and stock performance: The data did not reveal any correlation between the size of a brand's fan count and its 12-month stock performance. Among these top fan pages you will find brands like Walmart, Hershey and eBay, with share prices up more than 25% in the past twelve months, but you will also find companies with stocks that have dropped more than 35%, such as Research in Motion, Nokia, Facebook and Best Buy. On average, the companies in this list saw share prices increase just 2.9% in the past 12 months, lagging the major market indices (such as NASDAQ and the DJIA), which are up 6.6% to 6.9%. There is no evidence that investors care about large Facebook fan bases or that having large numbers of fans enhances business results in a way that investors notice or value. Weak positive correlation (+0.2) between customer satisfaction and stock performance: Not surprisingly, real affinity mattered more than the fake variety represented by Facebook fan numbers. For these 40 brands, there is a slim but positive correlation between the companies' ACSI ratings and their stock performance in the past year. Satisfied customers tend to result in satisfied shareholders. The companies included in this analysis and the data collected can be found at the end of this blog post. Stop Using Fan Counts as a Measure of Social Media Success: Working to increase fan counts without consideration for brand affinity can lead to activities that hurt rather than help. If you strive to collect Facebook fans that have true affinity with your brand, your fan growth may be slower, but you will be rewarded with authentic fans with higher EdgeRank; these are fans that see and engage with your content and are more likely to make their friends aware of your products and services. But if you resort to trickery such as sweepstakes and game giveaways, you end up collecting fans with little affinity and low EdgeRank. These faux fans are unlikely to see your content or speak on your brand's behalf, which means you will have invested your company's budget without having delivered business results. Do Not Blindly Trust Published Studies (Except This One): There are many "studies" that are unleashed on the blogosphere for the purpose of PR and not enlightenment. Use judgment as you read blogs and press releases, and do not mistake assumptions and opinion for facts and data. (This is why I shared the actual data: so that you can consider and verify the analysis for yourself. Plus, I have nothing to sell you!) For example, a while back, a social media management provider got a lot of press by announcing Blackberry's Facebook fans were worth $240 million to the company--$83.98 apiece. Social media bloggers and presenters breathlessly repeated this figure without stopping to consider if this was plausible. To put that figure into perspective, Sprint has 56.4 million subscribers and a market cap of $12.9 billion, which means investors value Sprint's actual paying customers at $228.72 apiece. Does it make sense that a real, paying, contracted subscriber is worth $228.72 while an individual who clicked a "like" button is worth $83.98? Of course not, as evidenced by Research in Motion's results in the two years since this crazy fan valuation figure was announced: Revenue has dropped 39% and the firm lost $20 billion in market valuation. RIM's huge Facebook fan base did not prevent it from arriving on death's doorstep. Focus on Advocates: You do have some customers who may be worth $83.98 to your organization; in fact, they may be worth far more than that. 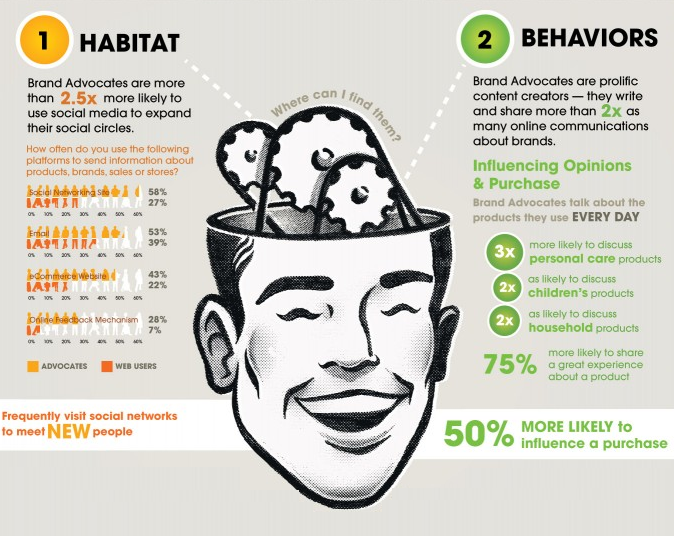 These are your advocates--people who spend more, recommend your brand and influence the purchase decisions of others. 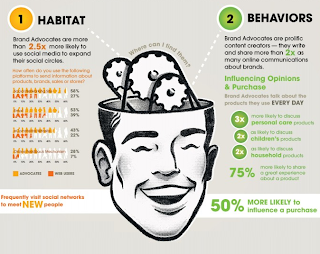 BzzAgent, in a study I find very credible, found that brand advocates create twice as much brand content, are 70% more likely to seen as a good source of information by others and are 50% more likely to influence a purchase decision. To be clear, advocates and influencers are different, as noted by Cara Fuggetta on the Zuberance blog. If you wish to pursue a PR-like influencer strategy, do so, but do not confuse this with strategies designed to meet the very different needs, wants and outcomes of your value-driving advocates. Scale to Create Satisfied Customers, Not "Fans": Which came first, the chicken or the egg? That philosophical dilemma has no answer, but I do know which comes first, a happy customer or a Facebook "fan." As evidenced by the correlation between customer satisfaction and market performance, brands are much better off increasing the number of satisfied customers rather than the number of their Facebook fans. There are ways to use social media to increase customer satisfaction; this is not done with sweepstakes and games but with in-channel responsiveness and functionality that satisfies customers' needs. In the past three months, I reached out to three national brands using Twitter--Dell, Sprint and Yahoo--and did not receive a response from any of them. Doing social at scale is not about the biggest marketing budget or the most fans--it is about having the right resources to meet customer expectations in the social media channel. Some folks claim that we have entered a stage of maturity in the social media era, but from where I am sitting, we are still barely taking baby steps. So many brands are desperately pursuing ROI and increasing their social media marketing budgets, but few are deploying the sorts of social business strategies that create happy customers and engaged advocates. There is too much focus on the click of a "follow" or "like" button and not enough on how social changes the brand/customer relationship. Social media managers love large fan bases because they look good to the bosses, but it is how you get fans that matters, not that you merely have fans. To drive business value, invest in creating happy customers who want to be your Facebook fans, not in Facebook fans you hope will become your happy customers. Despite numerous examples of employees losing their jobs due to dubious social media activities, many continue to harbor misconceptions about free speech and employment law in the U.S. Simply put, your employer is under no legal obligation to respect your freedom of speech. Failing to recognize this can cost you your job and hurt your career as it has for people ranging from celebrities and pro athletes to job candidates and interns. The First Amendment of the U.S. Constitution secures your right to free speech, but only from Congress. The amendment establishes limits as to the laws Congress may pass that abridge your freedom of speech, but it offers no protection should your employer send you packing over a post or tweet. A variety of state laws and National Labor Relations rules may offer some protection under certain circumstances, but an ounce of prevention is worth a metric ton of cure when it comes to your job and career. The attitudes of younger professionals are particularly dangerous. While many older folks have a tendency to approach their social media activities with a bit of caution, today's young adults just entering the workforce have grown up with the transparency of the social era. They tend to think everything and anything is in bounds when it comes to "personal" social profiles. They are wrong, and there is a trail of lost jobs and broken careers to prove it. Post Insensitive Ethnic and Racial Comments: Just yesterday, Voula Papachristou, a Greek Olympic athlete set to compete in London, was bounced from the team. Her offense was a single tweet; a bad, racially insensitive joke: "With so many Africans in Greece, at least the West Nile mosquitos will be eating food from their own home." This 23-year-old woman has spent her entire life training for an opportunity she will likely have only once in her lifetime, and she trashed it in the time it took to broadcast a stupid 140-character tweet. It is likely 2012 was Papachristou's only Olympic opportunity--in 2008 she competed in the World Junior Championships and in 2016 she may very well be too old to make the team--and now she will be watching the 2012 Olympics on television rather than representing her country. The head of the Hellenic Olympic Committee said something every employee should heed: "She made a mistake and in life we pay for our mistakes." Post Party Pix: We all love to share photos of good times, but you should consider potential ramifications before uploading that photo of you doing a beer bong. In 2009, teacher Ashley Payne resigned after an anonymous email claimed that a student had seen her vacation shots, including ten pictures of her drinking alcohol, and that this set a bad example. In 2008, 18-year-old New England Patriots cheerleader Caitlin Davis was fired after some offensive party photos appeared on social sites. Combining the first and second bullet points in this list, Davis was seen leaning over a passed-out friend whose body had been covered with graffiti that included swastikas and comments such as "I'm a Jew." Use Social Media After Calling In Sick: If you call in sick, just remember that your boss and coworkers use Facebook and Twitter, too. In 2009, a Swiss insurance worker lost her job after surfing Facebook while off sick. She told her boss that she needed to miss work because she was unable to work in front of a computer but was then seen posting on Facebook. (She claimed it was on her iPhone from bed, but her employer was not buying it.) 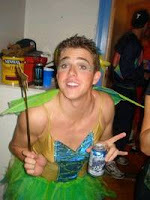 In 2007, intern Kevin Colvin told his boss that he needed to miss work due to a family emergency, and then he posted a photo of himself partying in a Tinkerbell outfit. If there is anything worse than getting fired because your employer catches you in a lie, it might be doing so while having your embarrassing photo shared worldwide. Post Evidence Of Rule Violations: Breaking your employer's rules is dumb; doing so and then sharing the evidence on a social network is insanely stupid. 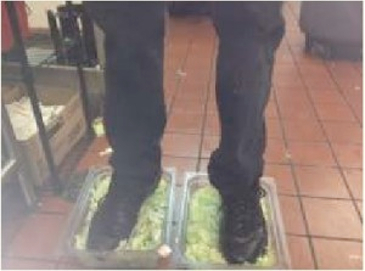 Just last week, three employees at a Mayfield Heights, Ohio Burger King lost their jobs because one thought it would be funny to post a photo standing in tubs of lettuce. The picture was uploaded to 4chan, an online community, and 15 minutes later community members had tracked down the restaurant location using the GPS data encoded in the file. This is hardly the first time Burger King has faced this sort of problem--in 2008, several employees of another Ohio Burger King lost their jobs after a video appeared online of an employee taking a bath in the restaurant's kitchen sink. And in 2009, two Domino's employees not only were canned but also arrested after posting a YouTube video of themselves despoiling customers' food. (Imagine the luck they will have landing jobs in the future, since they not only have to admit they were fired but also reveal they have police records). Even well intended posts can get you terminated if they violate employer policies. Earlier this year a restaurant dismissed an employee after he posted an image of a receipt revealing a particularly bountiful tip from quarterback Peyton Manning. The server obviously intended this as a positive shout-out to Manning's generosity, but as the restaurant owner noted, "This goes against every policy we have." Embarrass Your Employer in Social Media: We all know that in the age of social media, an organization's reputation is one of its most vital assets. No surprise, then, that companies seek to protect those assets from employee lapses. An Arizona Daily Star reporter tweeted a criticism of a headline in his newspaper and was asked to refrain from social media activities that could damage the paper's reputation. Later, after a local TV station complained when the reporter mocked the spelling in one of its tweets, the reporter was dismissed. He appealed, but the National Labor Relations Board upheld his termination. Those of us who are responsible for corporate social media are in an especially risky position when it comes to protecting (or harming) our employers' brands. 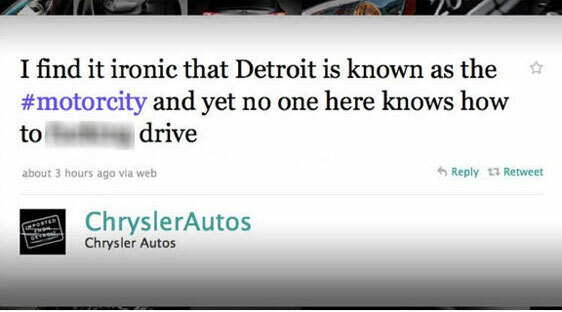 Last year, an employee not only lost his job but got his agency fired when he mixed up his personal and corporate Twitter accounts, resulting in Chrysler tweeting, "I find it ironic that Detroit is known as the #motorcity and yet no one here knows how to (expletive) drive." And, in yet another example that demonstrates even celebrities are not immune to these dangers, comedian Gilbert Gottfried lost his gig as the voice of the Aflac duck when he posted truly insensitive tweets following Japan's tragic tsunami. One such tweet read, "I just split up with my girlfriend, but like the Japanese say, 'They'll be another one floating by any minute now.'" A bad joke is not when no one laughs--it's when you lose your paycheck. I am not suggesting you avoid social media out of fear for your job security, but it should not be news that posting and tweeting come with risks. What can you do to diminish these risks? Do not post anything you would not say to your boss (or your mom). Never, ever criticize or make "funny" observations about your boss, your employer or your coworkers. Know your employer's policies about communication, social media and protecting customer data. Filter yourself--if you have a moment's doubt, don't post it! Protect your friends--if they are doing something stupid on a social network, tell them quickly. These are not blanket recommendations, because my social media experience has been very positive, resulting in strong working relationships and an enhanced career. But if you fear, in a moment of weakness, you will let a sarcastic post fly or post an embarrassing picture after one too many, then take action now. We live in a world where your missteps can haunt you forever (Thanks Google! ), and there is no "fixing it" after the damage is already done to your career. The provocative title of this blog post will draw two kinds of people: People who know of USAA's social media reputation and hope to gain inside information, and former peers of mine from USAA who think, "What the heck is Augie doing?" The former will be a little disappointed and the latter much relieved, because the secrets of USAA's success are not that secret. But they are still incredibly powerful. USAA has been lauded by many for its progress in social media, particularly within the highly regulated financial services industry. (It's a heck of a lot easier to embrace social media when your product is shoes or laptops than insurance and mutual funds.) 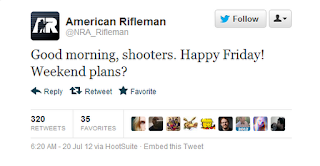 Despite the challenges, USAA is routinely cited for doing social media right. It was ranked among the top banks in its use of social media, has been featured in a Forrester case study about how to drive sales with social media, and a financial publication recently noted, "Pound for pound, USAA trumps all other financial institutions in social channels." Do Everything Else Right: I'm not trying to be trite here, although I am trying to make a point. Success in social media isn't primarily created by your firm's content strategies, its Pinterest boards or its tweets. The best social media strategies cannot save a company that offers products and services that fail to meet customers' expectations, because word-of-mouth success comes from giving people experiences worth talking about and recommending. The operational excellence that creates USAA's social media success is the same thing that drives its business success and has resulted in USAA being named the top company at customer service and experience by J.D. Power, Forrester and Temkin Group. Focus On An Audience: It is the first step in Forrester's POST methodology and every other brand and marketing process: Focus on the needs and characteristics of a specific audience. You cannot be all things to all people, and that means not just including some but excluding others. USAA focuses on a specific audience, not just in marketing or social media strategies, but with every tactic, product and service throughout the enterprise. Although anyone can open a USAA bank account, the organization doesn't try to acquire just anyone--it stays true to its mission of focusing on the financial needs of those who have served in the US military and their families. Focusing on this one audience allows the organization to prioritize products and services, sharpen messaging and media buys and, most importantly for social media, participate and support existing communities of people with similar needs and attitudes. Have a Higher Calling: No matter what it says in corporate employee manuals or annual reports, consumers know the mission of most companies: Make money for shareholders. It should not be surprising that this mission fails to motivate affinity and advocacy. Some companies, however, live by a higher calling. Apple, Google, Coca-Cola and Wal-Mart all stand for something. They might not appeal to you specifically (see prior bullet point), but these companies believe they have a mission beyond selling products. USAA has a mission, and it's not just on its website. This mission is the first slide in virtually every deck I saw as an employee. USAA's CEO begins every Board meeting by reading it aloud. Employees can recite it. And I've seen ideas killed when someone asks, "Does this fit our mission?" USAA's mission is a way of life, and USAA members know this. It's why USAA has the highest Net Promoter Score of any company in America. Hire the Right People or Make Them the Right People: One of the benefits of defining your brand's audience isn't just that you know who to sell to--it also helps you know who to hire. Out of approximately 24,000 employees, 12% are veterans, another 8% are military spouses and many more are family members of current or former service members. Many USAA employees know firsthand the sacrifices and commitment made by the people they serve, and those that don't quickly learn. I did not have a strong affinity with the US military when I joined USAA, but the organization quickly changed that. Every new employee's first week at USAA is dedicated to training, not just about products or how to find your way around the massive USAA complex, but about what it means to serve. You eat a military MRE (Meal Ready to Eat). You stand at attention when a senior officer enters the room. You get deployment orders and consider what it feels like to prepare your family financially and emotionally for the fact you won't be a part of their daily lives for a lengthy period. You may enter new employee orientation thinking of USAA's audience as customers, but you leave it thinking of them as people who deserve the best you can give. Focus on What Matters in Social Media: USAA didn't enter social media thinking of it as a marketing channel. The organization's first forays into social were about fostering community, educating people to make better financial decisions and responding to customer service needs. In other words, USAA dedicated itself to doing right by members rather than investing in what it could get from members. And members responded by making USAA the most popular Facebook fan page in the insurance industry--for a while. USAA has since been eclipsed by brands that used sweepstakes and game freebies to collect more fans. Despite the smaller fan base, I invite you to check out the likes, shares and comments on another insurance or bank fan page and then visit USAA's. Right now (Monday the 23rd at 5 pm), USAA has over 27,000 people "talking about this" (and doing so positively, I might add) while few of the top insurance companies or banks in the US cracks even a few thousand people "talking about this." There you have it--five "secrets" to USAA's success. Nothing but good old-fashioned customer-oriented business. In fact, some might even call this basic blocking and tackling. I just hope my next employer can block and tackle like this! I've been engaged today in a running dialog on Twitter, my blog and Social Media Today about why 20-something social natives are not better suited than older people to lead social media. The thing that frustrates me most of all is not the lack of self-awareness of young adults; after all, we've all been there, and today's Millennials are no better or worse than Boomers or Gen Xers in their 20s. Instead, what annoys me is that so many people think social media offers some sort of shortcut--a way to bypass time and hard work for their careers or their brands. Social may change a lot, but it doesn't change what really matters, and this means there are no shortcuts to earning success. Relationships are not formed, value is not created and skills are not honed without time, investment and effort. Getting someone to have a true relationship with your brand is not accomplished with the click of a "Like" button, and attaining positions of leadership within the corporate world does not happen because you tweet constantly and have a cell phone surgically attached to your hand. Facebook, Twitter and other social tools may change how we manage our careers and brands, but they don't change what is required to succeed. I've long railed on my blog against brands that think they can buy fans with sweepstakes and social game giveaways. We've seen story after story of brands accumulating hundreds of thousands of fans using these methods, but have these brands really succeeded at anything? They've gained a Facebook "fan," but have they gained a loyal customer or an advocate? These brands believe they've acquired a prospect, but with little to no affinity and low EdgeRank, this connection is as thin and valueless as a purchased email address. This isn't a relationship--it's a mockery of one--because relationships take time, effort, mutual interest and shared values. The brands that are truly succeeding in social media are not the ones taking shortcuts but the ones that stand for something, commit to the customer and work hard to earn a lasting relationship. The same is true for social media leaders. Some young people think they own the market on social leadership because they've grown up with social media. By this logic, Steve Jobs, a man who did not grow up with mobile tech, should never have been able to relate to the way young people use tablets and cell phones. How could Walt Disney, a man who was in his 30s when television reached mass adoption, have succeeded at creating entertainment for children of the TV era? Dr. Dre, who turned eighteen when Bob Seger and the Silver Bullet Band topped the charts, still produces music relevant to young people year after year. And let's not forget people like Brian Solis, Scott Monty and Frank Eliason, recognized leaders in social media, despite the fact Facebook launched after they were 30 years old. Beyond the gaping holes in this 20-something logic lies the same sense that social media can be a shortcut. Why should young professionals have to put in years of hard work, prove themselves, earn their way up the corporate ladder, gain experience managing budgets and people, and validate their judgment in ever larger and riskier programs when, you know, they all tweet and post? They're social and that counts for something, doesn't it? Social media and social business are not shortcuts. They do not make earning loyal customers or earning job promotions any easier (although failing to use social media appropriately may make both more difficult). They operative term here is "earn." 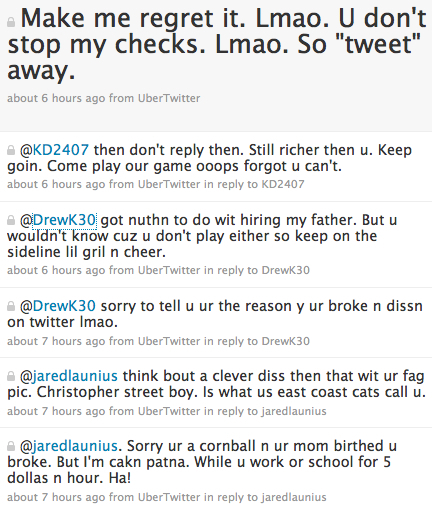 You earn these things; you don't just get them because you are merely present in social media and have a Klout score. Later this week, the Olympics will begin, and two thousand athletes will compete for 302 gold medals. A billion children run, jump and swim, yet only 302 gold medals will be awarded. It takes more than just showing up to be the best. It takes hard work. It is earned. Over on NextGen Journal, a young woman named Cathryn Sloane has kicked up a lot of dialog with a blog post entitled, "Why Every Social Media Manager Should Be Under 25." In it, she complains about companies that post social media job openings "looking for five to ten years of direct experience" and asserts that "the candidates who are in fact best suited for the position actually aren’t old enough to have that much experience." I was going to respond to Ms. Sloane but then I realized I already had. Three years ago. When she was a sophomore in college. In July 2009, I wrote a blog post about a social media blunder caused by an intern, and I urged companies to consider the importance of social media and the need for mature, experienced leadership. I was going to edit my old blog post to update it just a bit, and then I realized I didn't need to do so. While the social media world has matured in the intervening years, the need for true leadership and not just social media familiarity (which Ms. Sloane fails to recognize are not mutually exclusive) has not changed. In fact, it has increased. I have already written about the difficult job of being a Community Manager. At times, it can seem reputation issues and career threats are waiting around every corner, such as when an employee neglects to verify on which account he is tweeting or a natural human emotion gets the best of someone, resulting in an ill-advised post. There are enough risks without adding to them unnecessarily, which is why everyone who does social media for a living has to read the news and stay abreast of context. The reaction was angry, the NRA apologized, and the account is now deleted. A spokesperson noted, "A single individual, unaware of events in Colorado, tweeted a comment that is being completely taken out of context." 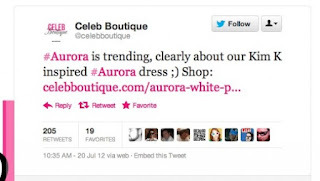 "#Aurora is trending, clearly about our Kim K inspired #Aurora dress ;) Shop: celebboutique.com/aurora-white-pleated-v-neck-strong-shoulder-dress-en.html"
After angry responses (including TechCrunch unfairly accusing the retailer of "Epic Insensitivity"), the boutique apologized, noting, "We are incredibly sorry for our tweet about Aurora - Our PR is NOT US based and had not checked the reason for the trend, at that time our social media was totally UNAWARE of the situation and simply thought it was another trending topic - we have removed the very insensitive tweet and will of course take more care in future to look into what we say in our tweets." 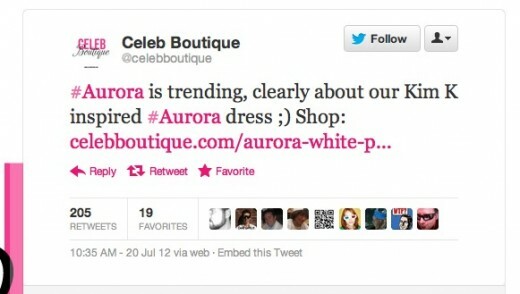 The boutique has kept their account active and apologized to several customers who took offense. For many smaller organizations and companies, however, there are not enough resources to have multiple sets of eyes on every account at every moment. The reputation of the enterprise often rests in the hands of community managers, who must exhibit good judgment, and this requires they be aware of what is happening in their and customers' worlds. Of course, the context of newsworthy events can cut both ways, too. At times, events in the world allow brands to show what they care about. On August 6 of last year, a NATO helicopter crashed, killing 30 US soldiers. At USAA, we felt compelled to say something--the association's customers serve in the US military, are veterans or have supported husbands, wives, sons and daughters as they deploy to dangerous corners of the world. Of course, there was great concern that the organization not be seen as exploiting the situation, but the association's members know that USAA hurts when they hurt and that USAA deeply appreciates the commitment of those who serve and the people who support them. After careful but quick consideration, USAA posted to Facebook, "Today's sad news out of Afghanistan reminds us of the debt of gratitude we have for those who serve and the many family members who support them. We must never forget that freedom isn't free." The comments received demonstrated that USAA's fans appreciated the heartfelt sentiment and shared both our sorrow in the situation and gratitude for the people who protect us. No amount of social media management tools or layers of review can replace good judgment and awareness of the context of the world. We can all be so brand focused that we forget that brands do not exist in a vacuum. You cannot know the right things to say in social media if you do not know what is on the minds of your customers, and that means CNN may be as important to your social media career as is Mashable. Today's news struck an especially personal note because I was one of those crazy people sitting in a movie theater last night at midnight for the premiere of "Dark Knight Rises." The experience was very communal. Batman character costumes and tattoos were flaunted and praised, and strangers in long lines took time to share their favorite scenes and expectations of the movie. It was a wonderful and social experience, and it is unfathomable that someone just like me in a crowd just like mine lost their life to something so ugly and unimaginable. My thoughts are with people grieving around the world today. Can Facebook Break Its Dangerous Addiction to Advertising? Advertising is an easy-to-understand and relatively easy-to-execute revenue source, but it may also be the least defensible, most risky of business models. Conversely, offering products and services that people trust and pay for is a difficult business model, but when it clicks, it brings stable, long-term success. Facebook is addicted to advertising but is signaling a coming shift toward services. I wonder if it is (or soon will be) too late for the social network to pivot from treating users as eyeballs to treating them as consumers of trusted, high-value services. If Facebook fails to make this pivot with enough speed or conviction, the future of social business may belong to someone other than Facebook. Although Facebook's advertising model may make some uncomfortable about what is being sold and to whom, one thing is clear: Advertising has been "bery, bery good" to Facebook (to paraphrase SNL's Chico Escuela). Facebook has been a remarkable success, growing from a dorm room to a $66 billion organization in just eight years, but the company's reliance on advertising could very soon become its Achilles's Heel. Currently, around 85% of Facebook's revenue comes from its own advertising, and the vast majority of the remaining 15% is derived from others' advertising income. Most of that is from game-maker Zynga, which is struggling with its own advertising-centric business model; daily activity has dropped 20% in two months and in the past three months, its stock has fallen almost 60%. Zynga's troubles could portend the future for Facebook. While much of the current buzz about Facebook's business model is around its struggles with advertising on mobile, the company's greatest challenge is not that it hasn't yet succeeded in turning people's cell phones into ad-delivery devices but that it only makes money out of delivering ads. I've long seen a rosy future for Facebook, but without more diversification away from advertising, Facebook may stumble, both on NASDAQ and in users' lives. The concept behind advertising-centric business models is simple Come up with a great idea that attracts time and attention, give it away for free or low cost, sell space so advertisers can reach eyeballs, and profit. It is neat and offers a simplicity anyone (especially investors) can understand: "900 million users? Americans devote 100,000 years each month on the platform? Facebook ad revenue up 37% year over year? Buy. Buy!" For a sign of how difficult ad models are to attain and sustain, just look at the top 10 websites in 2001. Seven were primarily based on the model of giving users what they want for free and selling ad space to brands: MSN, Yahoo, Neopets, AOL, Go, Excite and Geocities. Eleven years later, all are now struggling or practically dead. Only Yahoo remains in the top 10 sites, and its issues are well known with layoffs, leadership woes and negative revenue growth for the past three years. Of the rest, Go and AOL aren't even in the top 50 sites any longer, and Neopets, Excite and Geocities aren't in the top 4,000. Web 1.0 companies struggled, but what about old-line organizations that have succeeded with ad-based models for decades? They're not looking too healthy nowadays, either. The stock prices of the New York Times and Gannett have dropped 80% since 2002 as a result of a decade-long collapse in newspaper ad revenue. 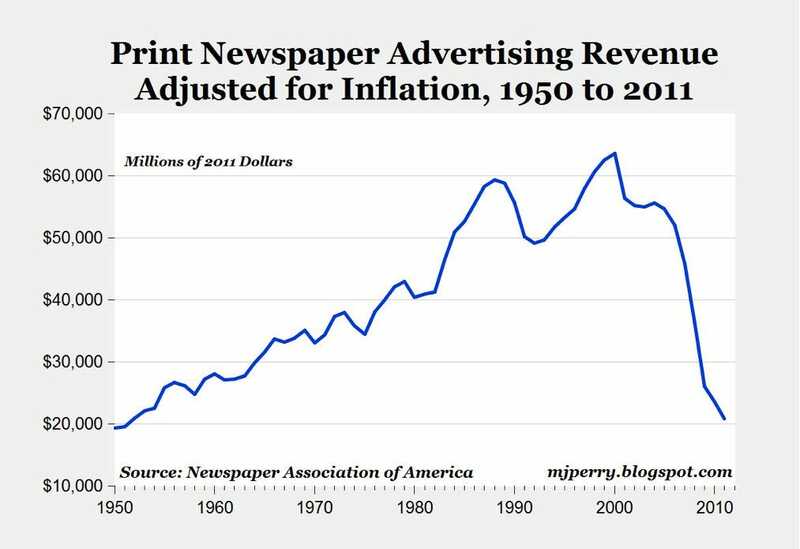 And if you think online ad revenue is replacing newspapers' lost print ad revenue, guess again; newspaper's online ad revenues grew from $808 million in Q1 2011 to $816 million in the first quarter of this year--an increase of just one percentage point. Advertising has generally been a more stable revenue model for network television, but the networks now fear that ad-skipping technology such as that offered by the Dish Network could further undermine an ad model that has been under attack from cable and timeshifting. You don't need to look at online-only companies to see that the advertising model is fraught with dangers. Of course, the young social media industry already has its own cautionary tale: MySpace was the undisputed leader of social not that long ago. It worked mightily to stay innovative in the advertising space, offering a self-service ad platform, search ads in cooperation with Google, and ad targeting based on users' interests. But in the end, a horrible user experience spelled the demise of MySpace, a problem created at least in part by the overabundance of advertising. In the age of the customer, it is very hard to win with a business model based on giving consumers something they don't like and don't trust. 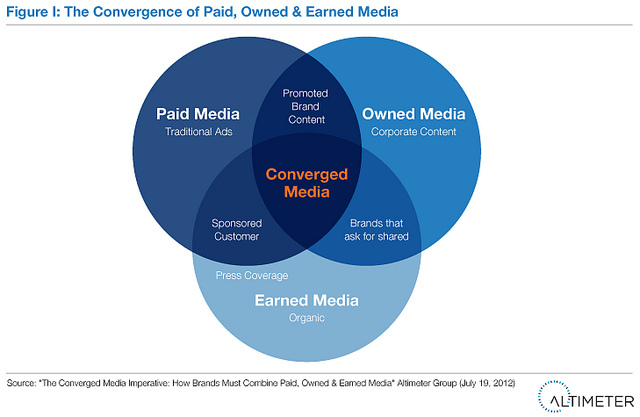 Don't get me wrong--advertising will always have a place in sales and marketing strategy (and Facebook's business model), but we cannot bury our heads in the sand and ignore the evolving state of the consumer/ad relationship: Fewer than one in four tablet users have clicked an ad on the device; trust in paid TV, magazine and newspaper ads has dropped more than 20% in just two years; only 33% of consumers have any level of trust in mobile ads; 71% of US consumers are watching more time-shifted TV from a year ago, and 96% of them skip ads on their DVR; and ad-blocking software are two of the top 10 most downloaded Chrome extensions and the most popular Firefox add-on. The consumer is more in control than ever before, and that means advertising is difficult and hostile soil in which to plant and grow a stable, growing business plan. But Facebook advertising is different, some would argue, because it can be based on what people really like and not merely on demographics and psychographics. Facebook had the chance to lead with a new form of consumer-centric advertising based on the true affinity people have for brands, people and activities, but that is not how Facebook's platform has actually evolved. Facebook allowed (and perhaps encouraged) brands to squander to value of the "like." Thousands of sweepstakes, giveaways and game freebies have created a situation where users' "likes" are a random collection of meaningless data points and not an indication of true brand affinity; for instance, I "liked" Gerber to vote for a friend's child in a photo contest, but I'm childless and have no relationship whatsoever with the brand. Nor has Facebook advertising helped to make the "like" a more meaningful signal for marketers. 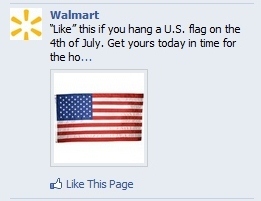 Take the ad at right; I'm invited to "like" something because I fly the US flag, but what am I liking--the flag? Walmart? A campaign page? Patriotism? US of A? Facebook's confusing and increasingly vapid "like" is a tremendous opportunity lost for Facebook, advertisers and users. If Facebook cannot create a compelling difference between the value of its advertising compared to other ad alternatives, then all it can deliver to advertisers are the same eyeballs as every other undifferentiated site and ad network on the Internet. The history of online ad values is well established, with CPCs (cost per clicks) pushed ever downward as page views and ad inventory soar. Facebook is well saturated in the US, so future growth won't come from adding large numbers of new users. Faced with this challenge, Facebook is seeding more ads into its user experience; Inside Facebook recently found that users may now be exposed to as many as ten ads per page. Populating more ads per page can increase ad revenue, but it comes at risk that Facebook could Myspace itself. Of course, there is one company that has succeeded wildly with an advertising model: Google. It rests firmly in the top 20 most valuable US companies, and it makes the vast majority of its money from advertising. According to the company's last quarterly filing, 96% of Google's revenue comes from advertising, and despite efforts to diversify, including owning the most popular smartphone platform in the US, that percentage only moved from 97% to 96% in the last year. Last quarter, Google earned $111 million of revenue from advertising per day. Google succeeded by fundamentally changing advertising, and advertisers beat a path to Google's door. The company didn't merely offer up content or functionality that people wanted (as did the seven dot-com media companies noted above) but instead became the de facto gateway to the Web for Internet users across the globe. It is worthy to note that one of the ways Google succeeding in differentiating itself wasn't just through its advertising but the lack of it--while other search engines and portals polluted their home pages with dozens of banner and text ads, Google's clean, white home page waited for consumers to indicate their interests before serving up relevant ads. Facebook has other ways to follow Google's lead and wring more value out of advertising without increasing page views or the number of ads per page. It could extend its advertising off of its platform (a la Google AdSense). Or Facebook could become a search engine, serving ads that match people's immediate and stated needs, just like on Google. With reports Facebook is readying its own competitive search engine, the social network could soon be competitive in the Search Engine Marketing space. Facebook can also increase its margin from advertising by validating its ads are worth higher rates. The company has several interesting case studies posted online, but advertisers aren't convinced, yet. When asked about driving purchase intent in a recent Citigroup/Ad Age survey, 19% of advertisers said they "don't know" if Facebook is useful, 13% said it's "not useful" and 55% said Facebook is "somewhat useful." And while 72% of advertisers said they expected their social-media advertising budget to increase, only 57% said they thought their Facebook advertising budget would increase. Of course, even Google isn't bulletproof--its stock has underperformed NASDAQ in the past year and has been essentially flat for the past five years. Among the risk factors cited in the company's recent 10-Q filing are that revenue growth and operating margins could fall due to "increasing competition." And it is interesting to note that in the 57-page filing, social media and social networking are mentioned just a single time--not as strategy or opportunity, but as a competitive threat. Facebook presently has an unsustainable P-E ratio of 98--Google's is 17 and Apple's is 15--which means Facebook must rapidly increase income or face more and substantial decreases in share price. It may sound encouraging that in the first quarter of 2012, Facebook ad rates rose, but assuming minimal growth in Facebook page views, these rates would have to increase 500% to bring Facebook's income inline with its stock price. That won't happen unless Facebook can change the face of advertising and become the next Google; otherwise, it must quickly demonstrate to the market that it has other solid and reliable business models for rapid growth. To increase revenue in the short run, Facebook could run even more ads on every page of the site. Or it could begin to offer new forms of interruption advertising, such as page-takeover ads and video pre-rolls. The company is also testing a new revenue source in New Zealand and Russia, where people can pay to have their posts reach more of their own friends. And Reach Generator promises brands that pay will get their posts seen, pushing aside the organic content from brands that don't. That little Italian restaurant you "liked" because you love it? Sorry, you will see less of its posts because big advertisers are paying to get more posts in your newsfeed. Did reading that past paragraph make you a little queasy? 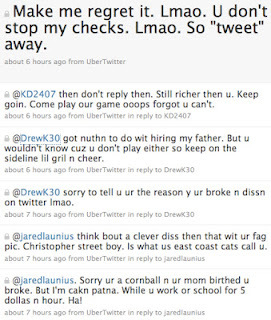 Does this not sound like the authentic, transparent future social media promised? Therein lies the true problem of Facebook's advertising model--it drives business and customer decisions that tend to upset users and weaken trust in the Facebook platform. Facebook users have griped about many of the changes the social network has made to increase ad views and ad value on its platform, such as the recent replacement of people's email addresses with Facebook.com addresses and Facebook's notorious and now defunct Beacon tracking program. While these incidents haven't caused the decrease in usage that some have predicted, they have come at a cost to Facebook: Few people trust Facebook. 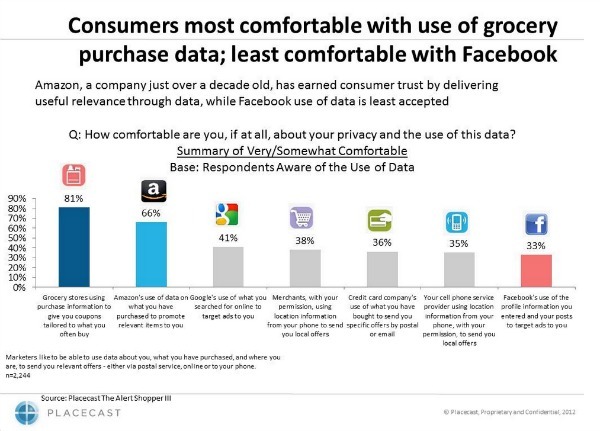 An AP-CNBC poll found that 59% of consumers have little to no trust in Facebook keeping their information private; customer satisfaction in Facebook is among the lowest of any site tested by the ACSI; female bloggers surveyed by BlogHer indicated more trust in blogs, Pinterest and Twitter than in Facebook; and ThreatMetrix found that a majority of consumers do not believe Facebook storefronts are committed to protecting them from fraud. It can sometimes seem that Facebook is immune to trust concerns; after all, Facebook's site accounts for one in five US page views and is deeply integrated into the web experience, with 22 percent of the pages on the Internet linking to Facebook and 8 percent using Facebook's Open Graph. With numbers like those, why should Facebook worry about trust? Because diversification of its business model requires that consumers trust the company. Changing the face of commerce is how Web 1.0 companies like eBay and Amazon created enormous wealth, but there is one giant difference between them and Facebook: Trust. Amazon is the second most trusted company in the US, and eBay is in the top 80 according to the Temkin Trust Ratings. Integrating itself into consumers' purchase behaviors without the same high level of consumer trust could be an insurmountable challenge for Facebook. Other potential business models Facebook might explore demand even greater trust. When Gartner predicted Facebook could begin to offer banking and insurance services, I scoffed because of the low trust the social network engenders; however, recent reports indicate Facebook is now testing banking services in Australia. With new business models like peer-to-peer lending growing at a rate of almost 200% annually, it's easy to see the appeal of social banking to Facebook, but will people really trust their savings and financial transactions with Facebook? There is considerable conflict between what Facebook needs to do to diversify its business model and what it loses with each enhancement of its advertising model. I don't believe it can have it both ways--if it wishes rapid growth of advertising income to support its stock price, that will further reduce Facebook's chances for success with other business models that require trust. Conversely, to succeed in diversifying, Facebook must make a strong shift away from advertising and start building consumer trust, but this will come at a short-term cost to shareholder value. If Facebook is going to stumble in the future and leave an opening for another service to become the hub of people's socializing--not just social communications but new forms of social business--it won't because some other site offers better features. (Sorry, Google+.) Instead, this will occur because Facebook failed to break its addiction to advertising quickly enough, resulting in more user-exploiting, trust-destroying platform changes.